There’s a good reason why depressed people find it much harder to deal with social rejection. The pain of social rejection lasts longer for depressed people, a new study finds. Depressed people’s brains produce less natural pain killers in response to social rejection. The research may help explain why depression can be so resistant to treatment. “Every day we experience positive and negative social interactions. Our findings suggest that a depressed person’s ability to regulate emotions during these interactions is compromised, potentially because of an altered opioid system. This may be one reason for depression’s tendency to linger or return, especially in a negative social environment. The study scanned the brains of 17 depressed people and compared them with 18 non-depressed people. Experimenters simulated social rejection by having them choose a date from a series of profiles. Then people were told they had been rebuffed by their potential dates. The brains of non-depressed people pumped out natural painkillers (opioids) in response. But the brains of depressed people showed reduced production of the painkillers. 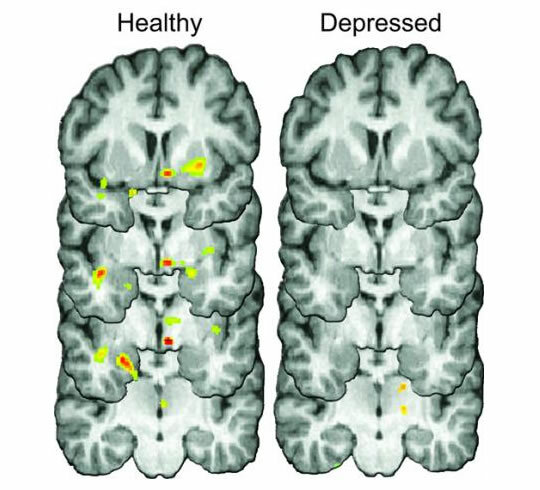 The yellow and red areas below indicate the release of painkillers in healthy and depressed people. After being rejected, depressed people also showed much lower motivation to connect with other people socially. The study’s results are published in the journal Molecular Psychiatry (Hsu et al., 2015). 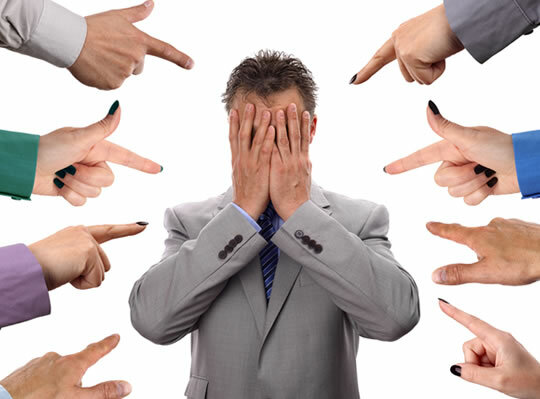 “Social stressors are important factors that precipitate or worsen illnesses such as depression, anxiety and other neuropsychiatric conditions. This study examined mechanisms that are involved in the suppression of those stress responses. The experiment also tested the effect of social acceptance — when people were told their chosen date was interested in them. One surprise was that depressed people felt just as happy and accepted as non-depressed people — but only at first. Unfortunately for depressed people, the feeling did not last that long. “Of course, everyone responds differently to their social environment.